Situated south and west of Shelburne Harbour, the twin beaches of Round Bay are separated by a fresh water outlet connecting an extensive wetalnd area and the shore. To the west, the Nature Conservancy of Canada owns property bordering the wetland. 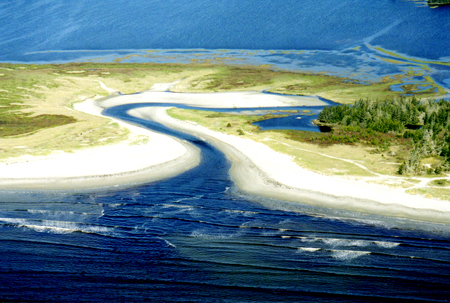 Depending on the tide and amount of fresh water present, it’s possible to cross the channel, especially during the summer when water levels are lowest. The beaches are constantly changing as sand and cobble move in and out and tides and currents shape the bay. Walkers, birders and photographers enjoy Round Bay and Roseway year round, and in summer, Roseway in particular is popular with visitors and families from nearby communities for swimming and picnicking. There is foot access to either beach, and a small parking lot is located at the end of Beach Road on the Roseway side. Roseway and Round Bay beaches are critical habitat for endangered Piping Plover and are included in the Roseway to Baccaro sector of the South Shore Important Bird Area. The extensive tidal flats are important feeding areas for fall migrating shorebirds, which can be seen roosting on Round Bay beach during high tides. Nesting, migrating, and overwintering waterfowl are found in the fresh water wetland, and the area contains a diverse ecosystem supporting a variety of plants, birds and other wildlife. ‘Sharing the Beach’ is an important principle of the MDS beach stewardship initiative. To balance the needs of beach users with those of plants and wildlife, the MDS encourages the wise stewardship of our beaches. 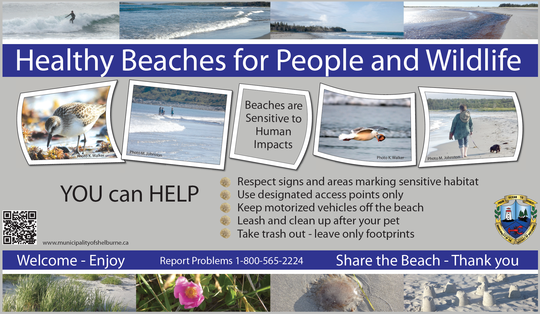 A 'Healthy Beaches for People and Wildlife' sign (see below) has been posted near the beach as a reminder to users of this important principle.